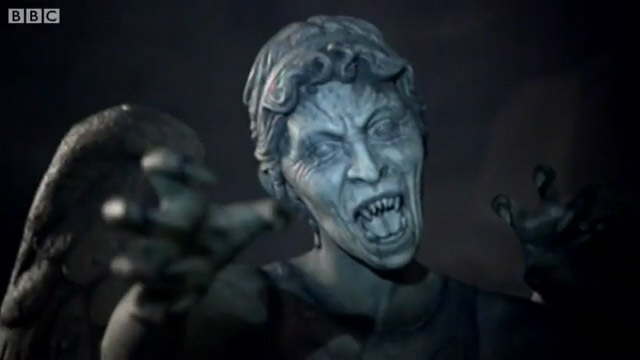 Don't blink - the Weeping Angels return! The Doctor is recruited by Father Octavian (Iain Glen) to track the last of the Angels through the terrifying Maze of the Dead. And the mysterious River Song (Alex Kingston) is back in the Doctor's life - but can he trust her? The enigmatic River Song hurtles back into the Doctor life but she’s not the only familiar face returning… The Weeping Angels are back! The Doctor is recruited by Father Octavian to track the last of the Angels through the terrifying Maze of the Dead. As the Time Lord faces the Lonely Assassins, last seen in Blink, River Song is by his side. These “angels” are actually aliens who have a built-in defense mechanism — if they come into anyone’s vision, they are transfixed into stone. But when those people look away, the angels move incredibly quickly to grab you. Their touch sends you back in time, and the angels feed off the residual energy of the life you would have had. * There are lots of clips of this episode in the trailers for Series 5. These include-A group of Angels not Weeping, not Screaming, just putting their hands in the air. * A clip for the episode heavily indicates that this episode will not chronicle River Song’s first meeting with the Doctor (from her perspective), as she knows, interestingly, how the pilot the TARDIS herself and claims that he “leaves the breaks on” (causing the materialising noise) and talks about him as if they have travelled together before.